Greetings Loyal Airmen and welcome to this week’s Flight Log. As many of you have already noticed, Airship 27 Productions has been in high gear since the beginning of the year and we’ couldn’t be happier. So here’s the news of our latest release. Number 8 thus far this year to those of you counting. “IKE MARS – Bloody Key,” is the first in as yet another private eye mystery series by the uber prolific Fred Adams Jr. Set in Pittsburgh, in the 50s, Ike Mars has the distinct honor of having been struck twice by lightning and survived both hits. Whereas the two jolts of nature’s electricity left his face muscles so malleable that he can actually shape his face to look like someone else for a short while. Not a bad talent to have if you are a private eye. 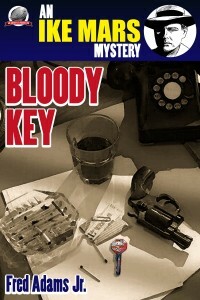 In “Bloody Key,” a small time crook stumbles into Mars on the streets one night having been shot. Before the man dies, he gives Mars a key. Which leads Mars with several questions. Who was the killer? Was the fellow shot because of the key? And now that he possesses it, is his life in danger? The answers to all these questions propels Mars into a suspenseful thriller that is a joy to read. As ever the book is available from Amazon in both paperback and on Kindle. And we thank you Loyal Airmen for your continued support. 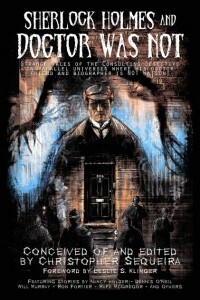 Meanwhile we have more news on the Sherlock Holmes anthology in which we have a story. 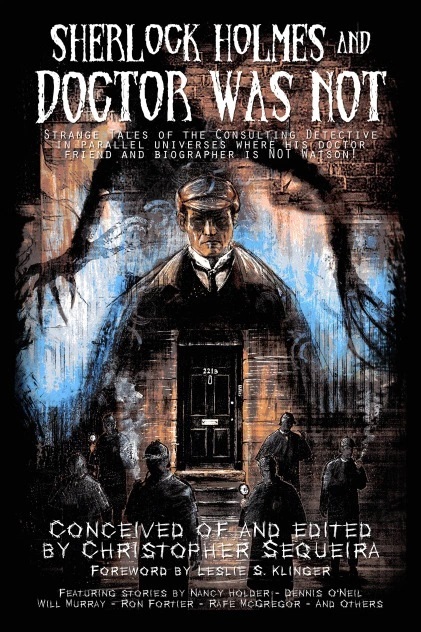 “Sherlock Holmes and Doctor Was Not” is now up at Amazon’s Kindle store for pre-orders. The actual hard copy will be out in June. (https://www.amazon.com/gp/product/B07Q3Y6BXS?tag=rpbookredir-20) Is the link to the page. We’ve teased friends and family about how this may well be the only Sherlock Holmes tale we will ever write..and we had a great time doing this one. Very, very anxious to hold this one in our hands. Often times in the past, the Air Chief has given you Loyal Airmen a little glimpse in how ideas for our pulp covers come together. Not being an artist, when an idea pops into our imagination, what like to have people pose for pictures that relay the composition. That way we can send that particular photo to the artist who will then do the actual drawing, using the photo as a guide. 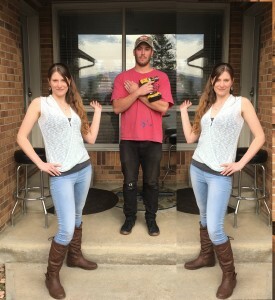 Well, the other day the Air Chief went and recruited his grand kids, Alex and Cora and asked if they would pose for such a picture and they happily agreed. It’s not the first time they’ve helped us out like this. Whereas we needed TWO young ladies in the picture, we merely did a mirror copy of the original, then cut and pasted the section with Cora to the left of her brother….thus giving us Cora 1 and Cora 2. Both thought the final result was hilarious. We aren’t going to tell you what title this was all done for, but do promise that when that book is published, we’ll re-post the picture above and let you Loyal Airmen see the final results. And there we have it for this week, Loyal Airmen. As ever, thanks for stopping by and we’ll see you all next week.